You may not have the time or the funds to go to Italy for your dream vacation this summer, but you can enjoy the dishes this country is known for without even leaving the city. Nothing goes better with the summer heat than some spicy Italian food followed by a refreshing scoop of gelato. Sound like your kind of meal? Then we've got just the place for you to visit this summer when the craving hits: Amici! What started out as a small priest-run canteen in Don Bosco has taken off as a successful franchise with branches in Tomas Morato, SM Megamall, Greenhills, SM North EDSA Annex, and Alabang Town Center. Known for its affordable prices and authentic Italian taste, Amici has long been the go-to restaurant of Makati dwellers for years. But now, those in the area have a new branch to visit—right in the middle of the scenic Ayala Triangle Gardens! Take a seat at one of the outdoor tables and enjoy the view of the park as you make your selection from a variety of scrumptious dishes. For newcomers, we suggest you try the bestsellers, such as the Al Quattro Formaggi (P298), their famous four cheese pizza, paired with the Spaghetti White Vongole E Gamberetti (P264), a light olive oil-based seafood pasta. Other interesting flavors cooked to perfection in their brick oven are the Frutti di Mare (P298), a mixed seafood pizza, and the Chorizo e Spinaci (P392), a unique Spanish chorizo and spinach pizza with white sauce. With a new branch comes a new menu, and two of their latest offerings include the Spaghetti ai Tesori del Mare (P264), a mildly spicy seafood pasta, and the Fettuccine al Tartufo Classico (P244), a triple-mushroom pasta fusion. For dessert, head on over to the Cara Mia side of the restaurant, the dessert branch of Amici. They specialize in gelato, and offer unique flavors like Sans Rival, Mango Jubilee, Guinduia (Choco Hazelnut), Mocha Straciatella, Toffee Almond Roca, and New York Cheesecake (all at P70/scoop). Even the diet-conscious and diabetic can join in the delight with Gelato Lite options in Cioccolato and Strawberry (each at P80/scoop). Craving for something heavier? Try one of their gelato cakes. The Banana Blast, a banana-split inspired creation, is their bestseller. Also try the Peach Walnut Passion and Mango Symphony, two creamy fruit-based gelato cakes that will truly satisfy your sweet tooth. And what's even better about Amici is that they want to share your joy with others! They've partnered with the Tuloy Foundation, which works to rehabilitate street children by providing them with basic necessities and vocational skills training. 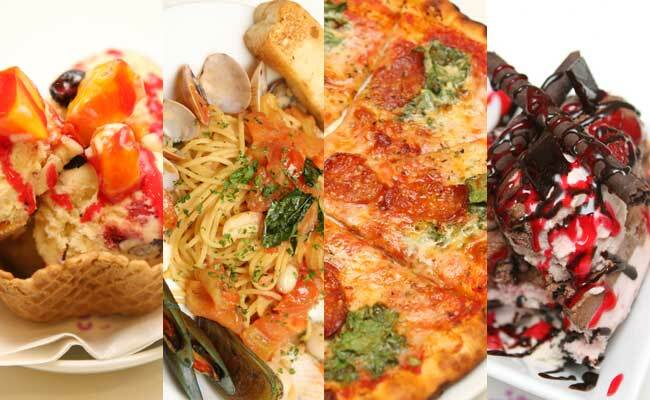 For every purchase from their Amici di Tuloy Menu, P10 will go directly to the foundation. Talk about a guilt-free meal. Launch the gallery to view photos of Amici's specialties and a review of each dish. Troop on over to the Ayala Triangle Gardens to treat yourself—and someone else—to a memorable meal.